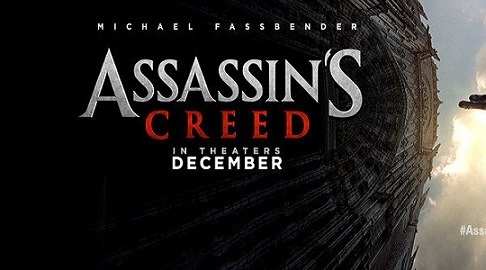 The film adaptation of the video game franchise will begin appearing at cinemas on December 21st. We have gradually learned more about the movie and broadly what will be happening. Justin Kurzel (Snowtown, Macbeth) is helming the project and has promised that the film will be exploring the same universe as the video game and that it will be very familiar to fans of the Assassin’s Creed games. The cast members include Michael Fassbender as Callum Lynch/ Aguilar, Michael K. Williams, Jeremy Irons and Marion Cotillard. This is a brief synopsis of the plot details that have been released so far. Callum Lynch is a descendent of the society of Assassins. In the modern day he is about to be executed by Abstergo Industries, but is rescued at the last minute. He undertakes a new technological procedure that grants access to genetic memories, at the Animus Project. This is how Lynch discovers his secret lineage and retraces the memories of his ancestor Aguilar de Nerha, an Assassin in 15th-century Spain, the era of the Spanish Inquisition. Lynch relives the experiences of Aguilar and gradually acquires the skills and knowledge from the Assassins to defeat their ancient enemy, the Templars, in his own time period. The script treatment is similar to the storyline dimensions of the video game, in which a bartender called Desmond in the modern day is harassed by Abstergo Industries and uncovers the truth about his genetic connection to an ancient band of assassins. The posters and images unveiled paint an interesting portrait of the set design and landscapes in 15th century Spain. Get ready for much action-packed sword fighting and leaping across the rooftops of tall buildings. The Ubisoft video game debuted on the PlayStation 3 in 2007 and has amassed an army of devoted fans. Hopefully, the movie will live up to the better video game adaptations.